Why would this help ? Because Nightingales are disappearing and people are not noticing. The fact that they are famous but mysterious and nocturnal makes this even more likely. If the BBC re-started an annual National Broadcast it would undoubtedly focus attention on Nightingales and help spur efforts to save them. 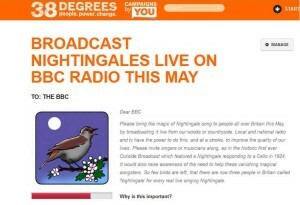 In 2014 we asked the BBC to re-start annual live Nightingale broadcasts. These were popular events from 1924 to 1942, following the first ever Outside Broadcast made by the BBC which featured a musician playing a cello and a Nightingale by her garden in Surrey, in May 1924. Last year we suggested May 18th but Nightingales mostly seem to sing earlier than that (maybe a change from the 1920s ?) so we have gone for May 2 – 9 for Nightingale Nights. With so few Nightingales left in Britain, there is all the more reason to use the power of the radio to give every person in the country the chance to listen in to their magical song. Please ask your local BBC radio (although other stations are just as welcome !) to help. Most of them have a ‘radio car’ or other capacity to do a live broadcast. If you’ve not signed the petition please do so now ! If you have, please share it on Facebook (Group at Nightingale Nights), twitter (@NgaleNights) or your other favourite social media. Tell your friends. Help spread the word and share the magic of Nightingales.